Source: CICH graphic created using data adapted from Statistics Canada, 2011 National Household Survey, Statistics Canada Catalogue no. 98-312-X2011024. http://census.gc.ca/census-recensement/2011/dp-pd/tbt-tt/Rp-eng.cfm?LANG=E&APATH=5&DETAIL=0&DIM=0&FL=A&FREE=0&GC=2478015&GID=0&GK=3&GRP=0&PID=102075&PRID=0&PTYPE=101955&S=0&SHOWALL=0&SUB=0&Temporal=2011&THEME=89&VID=0&VNAMEE=&VNAMEF= -accessed March 19, 2017. 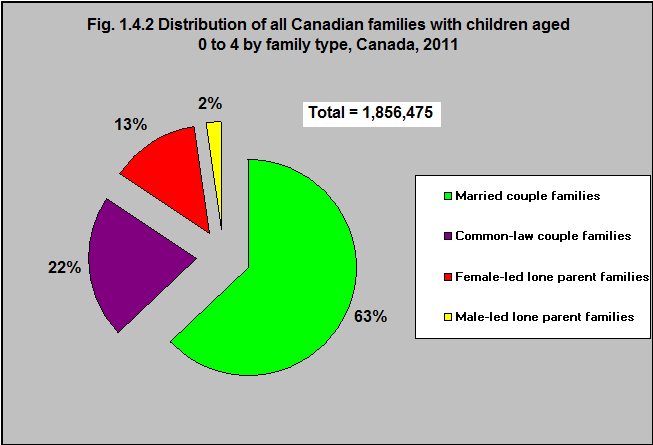 According to the 2011 National Household Survey, over 60% of Canadian families with children under age 5 were married couple families. A further 22% were common-law couple families. 15% were lone parent families – the majority being female-led. 1Statistics Canada, 2011 National Household Survey, Statistics Canada Catalogue no. 98-312-X2011024, accessed March 19, 2017. While the majority of Canadian children under age 5 live with both parents – 15% of them – more than 275,000 – live in lone-parent families. Lone-parents face the same challenges as other parents, but often have fewer human and financial resources to meet those challenges. For example, they may have increased problems harmonizing work and childcare schedules. They may be more likely to experience isolation and less likely to find time for themselves. Policies and programs that provide affordable, accessible child care; workplace policies that support parenting; and policies that support secure employment with adequate income can all change these realities for lone-parent families.